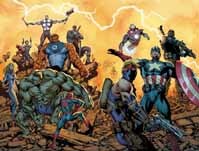 Marvel Comics opened its programming at Chicago Comic-Con on Friday with a panel devoted to its Ultimate Comics imprint. 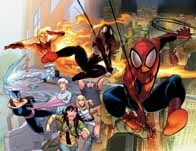 For covers and five- to eight-page previews of Marvel Comics titles arriving in stores on August 12, CLICK HERE. Titles include Cable #17, Captain America Theater of War: To Soldier On, Deadpool #13, Dominic Fortune #1, Incredible Hercules #132, Lockjaw and the Pet Avengers #4, Marvel Adventures Super Heroes #14, Marvel Divas #2, The Marvels Project #1, Ms. Marvel #43, Pride & Prejudice #5, Ultimate Comics Avengers #1, Ultimate Comics Spider-Man #1, Uncanny X-Men #514, Uncanny X-Men First Class #2 and X-Men Forever #5. For previews of Dark Horse Comics titles arriving in stores on August 12, CLICK HERE. For previews of Top Cow Productions titles arriving in stores on August 12, CLICK HERE. For previews of Archie Comics titles arriving in stores on August 12, CLICK HERE. For covers and seven-page previews of DC Comics titles arriving in stores on August 12, CLICK HERE. Titles include Batman #689 and Red Robin #3. For covers and six-page previews of BOOM! Studios titles arriving in stores on August 12, CLICK HERE. Titles include Farscape: D'Argo's Trial #1 and Toy Story: The Mysterious Stranger #4. Warner Bros. has released a description of the Losers movie, based on the DC Comics' Vertigo title. "An explosive tale of double cross and revenge, The Losers centers upon the members of an elite U.S. Special Forces unit sent into the Bolivian jungle on a search and destroy mission. The team -- Clay (Jeffrey Dean Morgan), Jensen (Chris Evans), Roque (Idris Elba), Pooch (Columbus Short) and Cougar (Oscar Jaenada) -- find themselves the target of a lethal betrayal instigated from inside by a powerful enemy known only as Max (Jason Patric). Presumed dead, the group makes plans to even the score when they're joined by the mysterious Aisha (Zoe Saldana), a beautiful operative with her own agenda. Working together, they must remain deep undercover while tracking the heavily guarded Max, a ruthless man bent on embroiling the world in a new high-tech global war." Principal photography began late last month in Puerto Rico on the Dark Castle Entertainment prodcution. The Losers is being directed by Sylvain White from a screenplay by Peter Berg and James Vanderbilt. Producers are Joel Silver and Akiva Goldsman. Other members of the team include director of photography Scott Kevan, editor David Checel, production designer Aaron Osborne, visual effects supervisor Richard Yuricich and costume designer Magali Guidasci.